I really thought I’d get more painting done in Southeast Asia. Although I filled a sketchbook, the blistering heat prevented me from taking the time to do larger watercolours. I guess my winter car painting is just no training for hot weather. 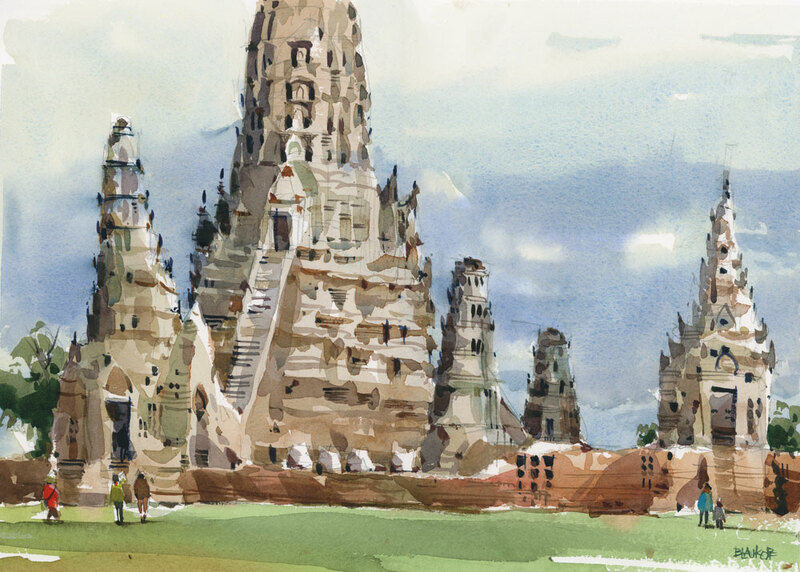 One afternoon at Ayutthaya, in the company of other sketchers, I found some time to paint Wat Chaiwattharanaram, a crumbling beauty of a temple, built in 1630. The light was rather flat with dark clouds on the horizon but there were not too many tourists around which made painting rather pleasant. When I was finishing up the painting in my studio today I noticed a little surprise on the surface: flecks of gold leaf had attached themselves to the paper — no doubt tidbits of the little gold sheets that worshippers place on the Buddha statues in temples all over Thailand. I think that type of travel allows for a lot of sketching but less painting. I just filled my books with ink sketches and moved on to do another. Now I am painting from photos. Not as satisfying but there wasn’t enough time to paint and the heat/humidity was too much! Exactly Gail. At least you are painting from photos now. I will try that later this week. The fact that you can actually spell the temple is..pretty amazing. I found a sketcher/painter today that you were probably w/! I mean..I had seen her work before but saw that she was at the same symposium..
Fun to find the GOLD. You are such a trooper in winter!! It is 102 here at 4 o’clock. I know how difficult it was for you! How I admire your endurance ! I tried a small view from the open doorway of my son’s new equipment building, and lasted for one small sketch. Was so anxious to find an air conditioner that I forgot to take a photo! High commendations to you all on pure physical endurance. And congratulations to all of you for such superb work! I love the gold flecks ! It is a sketch worthy of some gold flecks!! Love it! You captured the multi-faceted stone towers well!